Paytm’s move to charge a 2% fee for users who wished to add money through their credit cards has lasted all of one day. The company has announced that it is “suspending” the charge keeping users’ convenience in mind. But it says its fight against users who were using this service to get instant free credit will continue in other ways. “We will introduce new features to prevent credit card misuse in add money,” it said in a new blogpost. Its previous blogpost announcing the move now has the text dramatically struck out. Paytm had yesterday introduced a 2% charge on adding money via credit cards to its wallet. The company had said that several users had been misusing this feature by immediately transferring the money to their banks, thus in effect getting free credit. The company hoped that the 2% fee would discourage these users, and in order to not inconvenience its other users, had also thrown in vouchers worth 2% which could be later used to avail cashbacks. The move had drawn immediate negative responses from its userbase. Paytm had said in its initial blogpost that many users from national financial institutions were misusing its service; eagle-eyed users on Twitter had wondered how Paytm could’ve possibly known where its users worked. No sooner had Paytm smoothened that over (by saying that it came to know when users emailed them), people wondered if the 2% vouchers could be used at partner sites. 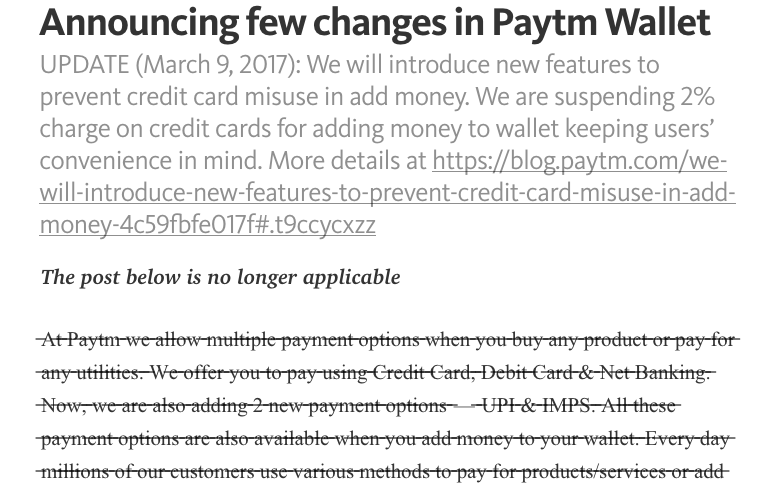 After much confusion, Paytm had to update its blogpost, and even publish a small FAQs infographic. Amidst all this, the competition pounced. Mobikwik trolled Paytm by announcing that it was giving its users an extra 2% cashback, as opposed to the 2% fee that was levied by Paytm. Paytm’s decision to roll back its charge has been met with mixed reactions. Some praised the company agility in rolling back a feature that had caused much confusion. @vijayshekhar Cool. As a technology company, this is what we expect from you. Keep tweaking your fraud detection algorithm. Others, though, compared the flip-flop to the several new regulations that had followed the government’s demonetization move. For now, things are back to normal with Paytm. But this incident shows how sensitive users can be the slightest change in user agreements. Paytm has heavily used cashbacks and freebies to get its 200 million users – it’s not going to easy for it to withdraw them without incurring the wrath of its users.